We’re living in the age of cheap flagship smartphones. Sure, the big guys like Samsung, Apple, and Google are all selling phones that start at $650, but a growing number of companies (usually from China) are hitting the US market with high-quality phones with dazzling specs and low prices. So what is the best sub-$500 flagship you can buy? OnePlus has just updated the already amazing 3 and transformed it into the even better OnePlus 3T, with a faster processor and better camera. But the previous titan of cheap flagships got a major competitor last month in the form of LeEco, who has introduced the super cheap but super high end looking Le Pro 3. 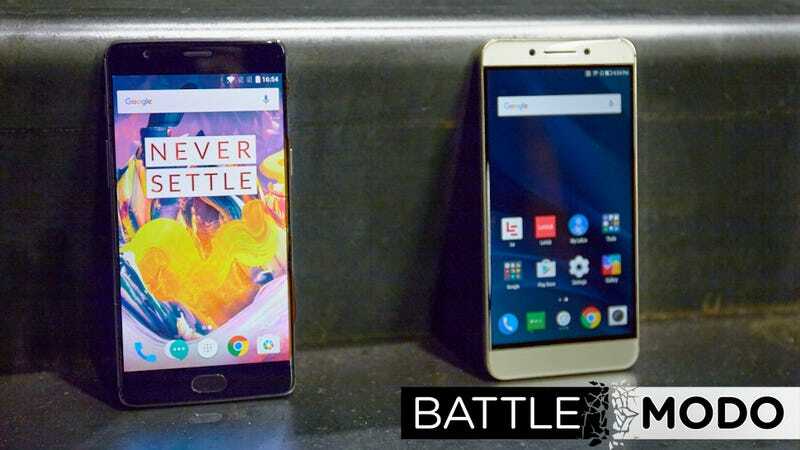 Both sell for under $450, both have the fastest Snapdragon processor available, and both want to be the new champion of cheap. On the inside, the Le Pro 3 and OnePlus 3T are remarkably similar. Both have 5.5-inch full HD displays, Snapdragon 821 processors, 16MP rear cameras, USB-C ports, and fingerprint sensors. Both also support fast charging with the right cable. The coating looks plastic and feels plastic. The OnePlus 3T has 6GB of RAM, whereas the Le Pro 3 has 4GB of RAM. This doesn’t matter unless you run a LOT of apps on a regular basis...you probably don’t run enough to see a notable difference. Both come with 64GB of internal storage (the OnePlus 3T is also available with 128GB for another $40); neither has a microSD card slot. When it comes to benchmarks, both phones performed admirably. On the AnTuTu Benchmark, both phones scored higher than the Google Pixel, a phone that costs at least $200 more. But in every day use, I didn’t notice a difference between phones. Both switch between apps, make calls, and handle Twitter notification bombs with ease. From the outside, the two phones look nearly identical. Both have aluminum unibody designs that have become so common with Android smartphones. The OnePlus 3T—which is replacing the OnePlus 3—shares its predecessors design. The Le Pro 3 has a plastic feel, but it’s a nice looking phone all the same. The big difference is the headphone jack. The OnePlus 3T has one. The Le Pro 3, like the iPhone 7, does not. Instead it opts to use USB-C. It includes a pair of USB-C earphones that look like EarPods (but are far less comfortable). Audio quality was just fine, but those headphones aren’t very comfortable, and you’ll need a dongle to use non-USB-C headphones. Along with the camera, battery life is one of the most important things to consider when buying a smartphone. OnePlus opted to pack in a bigger battery into the 3T than what was inside the OnePlus 3. Yet it’s the same size body. The battery, which is now 3400 mAh, is quite good for a phone of its size. The OnePlus 3T easily lasted me an entire day of us without having to plug it into the charger. And when you do need a top-off, you can fast-charge it fairly fast with OnePlus’s proprietary fast-charge tech, called Dash Charge. This is different from Qualcomm’s Quick Charge, but works basically the same way. By being ever-so-slightly thicker, the Le Pro 3 has an even larger 4,070 mAh battery. That meant nearly two days of regular use without needing to plug it in. And like the One Plus 3T, the Le Pro 3 has fast-charging too, via Qualcomm’s QuickCharge 3.0. Both phones have nearly identical rear cameras. They use Sony IMX298 16 megapixel sensors, which can record video in 4K. Yet the OnePlus 3T has optical image stabilization (OIS), and in my tests provided a much more detailed image, especially in areas that were too dark for the Le Pro 3. Yet both cameras will take good pictures in the right conditions (lots of sunlight) and are overall good shooters. Neither is going to be as good as what you can get from the Galaxy S7, iPhone 7, or Google Pixel, largely because these budget phones lack those other guys’ software refinements, but these aren’t bad cameras by any stretch. Both the Le Pro 3 and the OnePlus 3T run last year’s Android Marshmallow with their own custom skins on top. OnePlus plans to update to the just released Nougat soon, while LeEco has given no time frame. OnePlus uses OxygenOS, which it describes as “Android refined.” Most of the stuff is similar to the stock experience, but there are some nice tweaks, like a custom notification menu and a gesture for taking screenshots that I really appreciate. It’s a very clean experience free of unnecessary bloat. LeEco has gone the opposite direction with its EUI skin. If you want its cheap phone you need to deal with its excessive branding. It pushes the LeEco ecosystem, a major Netflix-like streaming service in China, by putting its own video apps front and center. These apps offer quick-access to videos from YouTube and other services, but the truth is I don’t need to see videos as much as LeEco seems to think I do, and I definitely don’t need to have a video button in the same spot that every other Android device puts the app drawer. LeEco also has its own suite of apps. including its own camera, music player, video player, email client and file manager. None of these apps are bad, but I much prefer the closer to stock experience of the OnePlus 3T. The notable thing about both the Le Pro 3 and the OnePlus 3T are that they manage to offer massive specs and performance at super cheap prices. The Le Pro 3's retail price is $400 from LeMall.com. The OnePlus 3T is a $440 from OnePlus.net for its 64GB variant and $480 for its 128GB mode. But that’s only part of the story. LeEco has this thing called LeRewards which makes it relatively easy to get the Le Pro 3 for $100 off. It runs these flash sales all the time—there’s even one for Black Friday that brings the price down to $280, and a lot of my previous criticisms don’t matter when the Le Pro 3 is $160 less than the OnePlus 3T. $280 for a solid phone with a Snapdragon 821 processor is insanely good. Back in June, we called the OnePlus 3 the best cheap phone you can buy. The OnePlus 3T is better in every way, faster processor, better selfie camera, improved battery life. But it’s no longer as easy to call this the “best cheap phone” you can buy. Because as LeEco is showing, real competition is here. If we’re simply looking at retail price differences, the extra $40 you spend on the OnePlus 3T makes it the better phone. It’s the one I would buy. But here’s the thing, if you can find the Le Pro 3 for $300—a price LeMall often sells it for—that’s cheap enough to help me overlook the UI problems and the finish that feels less premium. Even with its better UI, I don’t necessarily think the OnePlus 3T is worth an extra $140.